Filmindia has a Q&A section where readers ask and Baburao answers; Filmcritic does too, using the exact same format. Not because you publish a rip-off of his magazine? This section is the monopoly of “JUDAS” and he writes what he likes and about things which he likes. The views expressed here are not necessarily ours, but they carry weight because they are written by a man who knows his job. This feature is my monoply [sic] and herein I shall try to reveal and unravel the facts pertaining to the Indian Film Industry and the people who run it…I hope it will be acceptable to all those who appreciate our policy of “Fear none and favour none”. The immoral depths to which Baburao has fallen in abusing the persons and personalities of the industry is evident from every issue of Filmindia. The scandals which he spins about decent people to gain his own ends have become proverbial with one and all. It is a pity that all the evil in which he indulges has become his second nature and even if he wishes he cannot get rid of it. I am sorry to comment on the Press Branch of the Bombay Government. This august body or the officer incharge has, it appears, never cared to go through his stinking writings which call for a prosecution of this low writer…The way in which he expresses himself and the epithets he attributes to others make a display of utter bad manners and low-breeding. If there were any law in the Indian Penal Code to prosecute a man for massacring King’s English and exhibiting literary degradation Baburao would be sentenced to seven years rigorous imprisonment. His attacks are most ungentlemanly and his writing most abusive. His dictionary is that of scoundrels, ruffians and what not. After losing all respect in the eyes of his patrons and readers he has become desperate and foolish. And none but the strong hand of law can correct him. THAT the Kapoors of College Street are a strange clan. They try their best to sabotage a marriage, don’t actually attend the wedding but after the wedding takes place they give a grand reception to celebrate the event. What a perfect face-saving technique! Mrs. Prithviraj Kapoor got herself actually photographed feeding film actress Geeta Bali, her new daughter-in-law, and Geeta Bali didn’t bite her either. What a loving family which always becomes wise after the event! THAT saying that, “Newspaper people refuse to believe that glamorous film stars can cook. Well, I am going to prove all of you wrong”, film actress Usha Kiran cooked some “batata poha” and made the press boys eat the stuff. Now the Union of Journalists wants the newspaper bosses to construct more lavatories in their offices. That Madhubala’s ominousness has proved that without her appearance BADAL would have positively been a far superior picture and the poor producers could have saved themselves from an extra waste of about two lakh of rupees which hardly have been their entire profit. That Dilip Kumar is stated to be the latest victim of Madhubala’s misfortunes because whenever he insists on one or the other producer to co-star Madhubala with him, he gets a point-blank refusal and like an insulted man he goes back home. 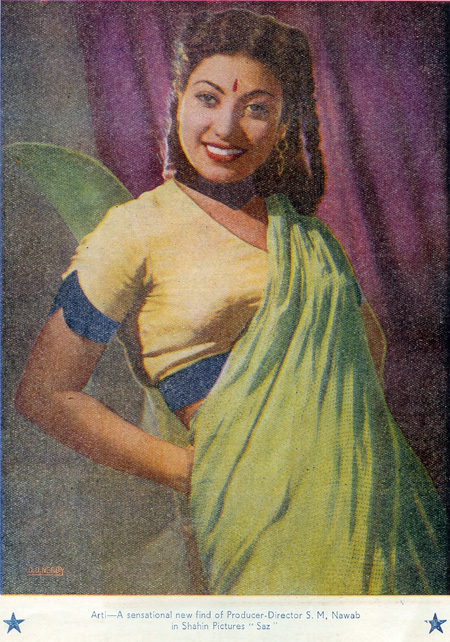 Filmcritic contains two color plates in it of actors, just like Filmindia does, except the paper quality and printing aren’t as fine, and neither are the captions. Still, they are fun to look at, even if Sensational New Find Arti vanished without a trace. The entire magazine is nothing but a wholesale copy of Filmindia, except lacking its production quality and humor (except the inadvertent irony of VN Nayyar’s avowed dislike of Baburao). It even has a section at the back on films in production called “Pictures In Making”—not even attempting a variation on Filmindia‘s “Pictures In Making” section. I love the tiara here, and the title of Rehana’s film: Shin Shanaki Boobla Boo! And I would kill to see this movie! VN Nayyar may have been a respectable man, a loving husband and a good provider for his children (or not, I really don’t know), but I’d rather hang with Baburao Patel any day. Eye candy is eye candy, but BP is one of a kind, for sure. Posted on December 18, 2009 at 4:08 pm in Baburao Patel's Poisonous Pen, Hindi film history, Hindi movies, Vintage Bollywood images	| RSS feed You can skip to the end and leave a reply. The pictures are truly awesome….Premnath’s so cute!!! Oh Hooray!!! I love her. 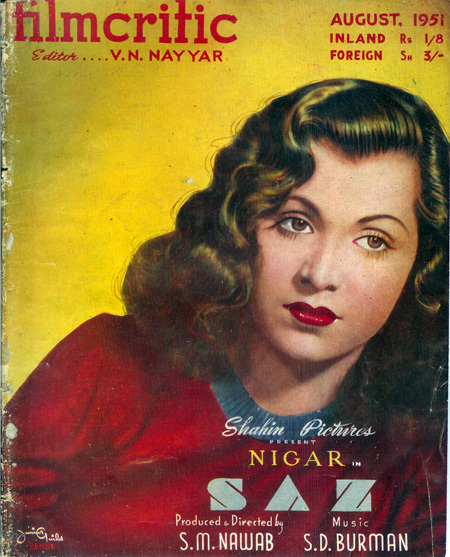 All I really know about her is that she had a long term affair with PRAN (I am sure you’ve read Manto’s book). It’s a great writeup—I didn’t know she died so young :( Thanks! Coz I knew Khel Khel Mein stars the Sources of Ranbir and Hrithik but I often wondered what is this ‘Shin Shinaki Bablaboo’ business?? NOW I KNOW!!!!!!! YAY Memsaab and Baburao Patel save the day. Now I can die in peace! Also, Nayyar sounds like a dried up ole prune and HOW DARE HE insult MY Madhubala? GRRRRR! He didn’t like Madhubala because Baburao P. DID. She is one of the few actresses that he didn’t rip to shreds. One of the questions to the editor was: “What does Baburao find in Madhubala?” And Nayyar’s answer was “Easy money and a misleared girl”…which doesn’t even make sense. Oooooh, that’s where I’ve heard it!!! I knew I’d heard it before but I didn’t know where. And now I’m stuck on misleared – what could he have meant?!!! I must know! 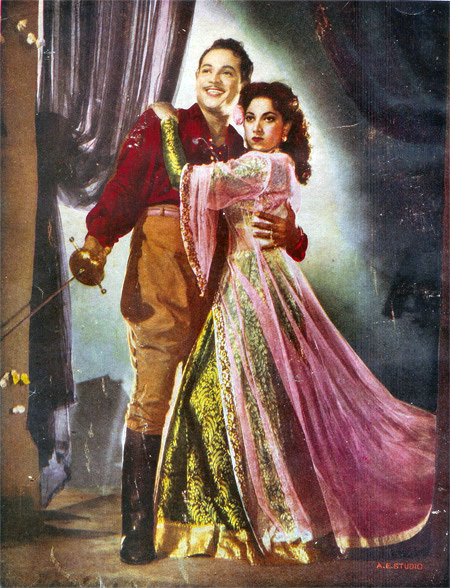 PS – if Salman Khan had any sense, he’d have ripped off that Rajput with a rapier poster for his Veer. So much awesome. Lol VK Nayyar, you can’t say you hate Baburao if your compelled to nick pieces of his magazine! I am soo in favour of Baburao, he just seems like the best and most acid-tongued journalist back then, maybe Bollywood’s nastier version of Walter Winchell+Hedda Hopper+tons more! Love the magazines where did you find them, I’m tempted now that I’m 19 to get a credit card just for these goodies that you find online! He didn’t nick pieces of Filmindia, he really cover to cover imitated it!!! Pretty funny indeed. This is brilliant. Considering we’ve just touched based on unrealised and incomplete films, Saz was one!!! BTW, where do you find these gems!!! We must meet next time you are in India. 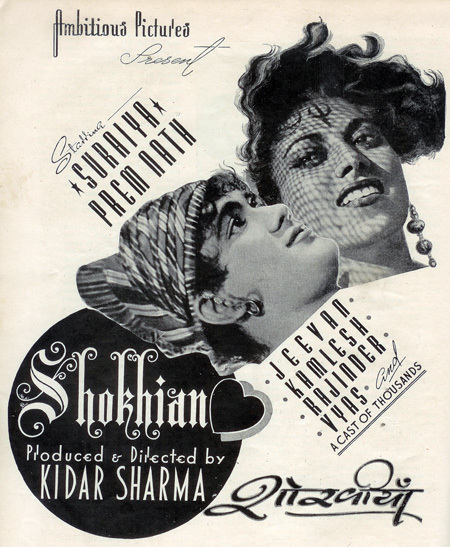 I collect song booklets of old Hindi films and have quite a few of them. It would be great going through them! Yeah, Banno and me stay walking distance from each other. Looking forward to meet! guess VK Nayyar never heard of hte saying “imitation is the best form of flattery”!! and Baburao’s “…they carry weight because they are written by a man who knows his job” was it a potshot towars Nayyar? Ouch!!!!!!!! I have no idea what Baburao thought of it all, but Nayyar is quite the hypocrite in this! I remember hearing songs from the movie Shin Shinaki Babla Boo on the radio all the time, nice to see its poster ! I would love to hear them myself…C Ramchandra composed them. Oo, I love that picture of Rehana! I *want* the tiara. Really WANT. lol I think V. K. Nayyar’s major problem is a severe case of bile-itis that he cannot “massacr[e] King’s English and exhibit… literary degradation” to the same effect as Baburao can. He cant even plagiarize in decent English! I thought of that too, but it’s probably nothing like The Women…since if men were introduced to the film it would completely change the whole thing! And VN Nayyar was definitely a sour, sour grape! I thought the same thing about For Ladies Only as Bollyviewer did – that it was some version of The Women – it could be, but flashback-riddled. Memsaab – when you make the movie version of the VN Nayyer Story – I think Patel and Nayyar should be the same person. Audience can suspect and then learn this two hours in, and then the Public in the movie can spend the last hour figuring it out. Motive to do with love & villains I’d say would be good. I finally realized that a film named ‘Shin Shanaki Boobla Boo’ does indeed exist. It’s mentioned in the song ‘Mere Jeevan Saath’i from Ek Duje Ke Liye. Created a little collage based on the song long ago. All thanks to you! Hopefully I will find the posters for other missing titles too. 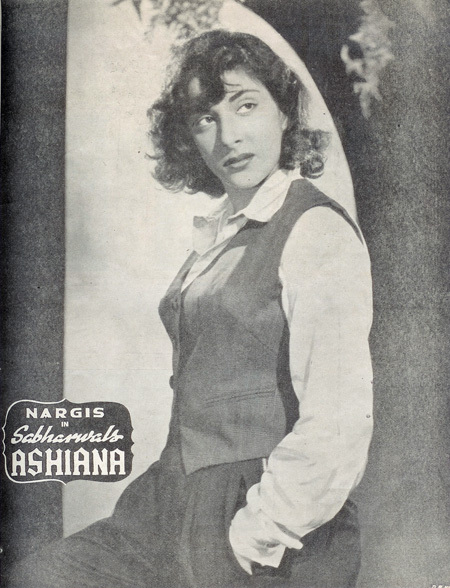 Wow, Nargis looks so fab! The film rajput looks like a bollywood erroly flynn with moustache and works! So what is the title of the film about ladies and their men? ‘Only’? 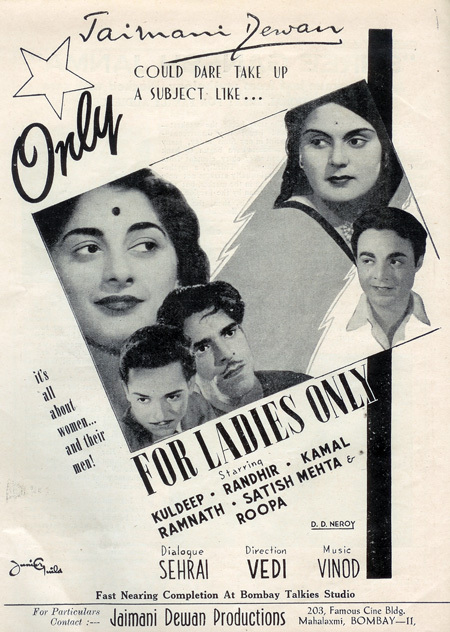 ‘For ladies only’? or ‘Only for ladies only’? I’ve heard the song sof Shin shinaki babla boo, fine to see its poster here! Love the gossip about usha kiron and the Kapoors of college street. The gossip is hilarious. I should do a whole post on Baburao and his “You’ll Hardly Believe—” column. “It’s all about The Women–and their men” was, in fact, the advertising tag line for George Cukor’s “The Women.” That gorgeous portrait of Nargis is included (without identifying the film) in “Mr. and Mrs. Dutt” which is why it rotates in my screensaver slide show. Loooove all the yummy fan mag photos. 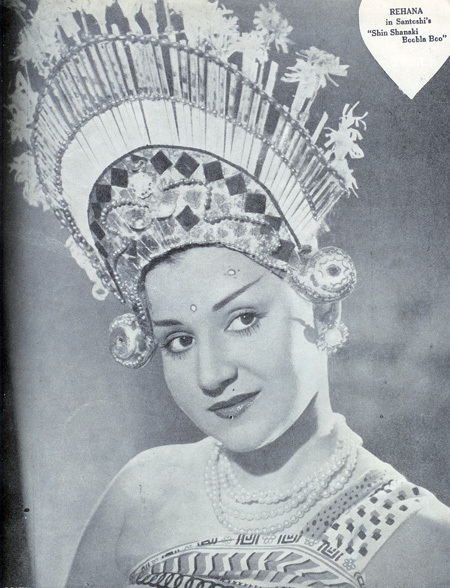 I collect Hollywood movie star scrapbooks, and wonder if anyone has the Indian equivalent. It’s so interesting to see what actors/actresses the fans (teenaged girls?) adored. Was it? Well I wonder if this IS a remake of The Women? That picture of Rehana is wonderuful, Memsaab! What is that on her head?? Looks like something out of a German Expressionism film. Thanks for all the glorious magazine clips! Made my day! I guffaw out loud at many things Baburao says :) And of course I covet Rehana’s headgear enormously. Very art deco, isn’t it? Very seriously, Memsaab – right now Topshop has some things in the tiara and Extreme Headgear line (a crown about 8″ high, made of real feathers, irridescent black/bottle green, on beaded headband, for example). Thought of you the afternoon I spent wearing a tiara around the store in NY. Ah, “Shin Shinaki Boobla Boo” is on the “most searched for” movies list for many of us who have a love of obscure Hindi films. I believe the title refers to Laila-Majnu type lovers. It’s fairly well known that C. Ramchandra and Lata had a passionate but tempestuous relationship in the 50s. Per legend, CR composed this song in one night after a particularly unhappy encounter with his ladylove. I read someplace that the song was written by CR at the behest of PL Santoshi, who was smitten with Rehana at the time and apparently sat outside her house all night one night when she refused to let him in. Your story makes more sense though, given that CR actually WROTE the song :) It is very lovely indeed! 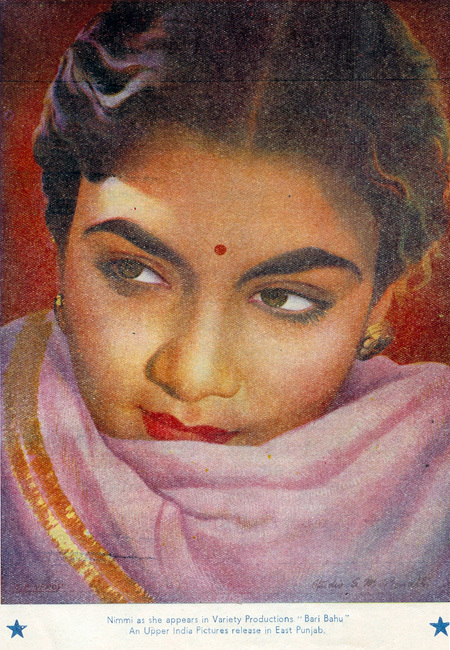 The gossip doing the rounds for years about Lata’s love of life is Rajsingh Dungarpur (hope i got the surname right) – an ex royal guy who was also the chair of the Cricket Control Board of India for a long time. Apparently he remained single for her sake. She has remained single due to family commitments since she had to take responsibility for her siblings at a young age having lost her dad as a child. Lata’s passion for cricket is well known in India. One of the movie titles was this. Trying to finish up a book called “Hindi Film Song: Music Beyond Boundaries” (so many books! So many films!). There’s a chapter on composer C. Ramchandra, and it discusses his song “Hum kitna roye,” from the movie “Shinshinaki Bubla Bu.” I went — wait a minute! And kicked my husband off the computer so I could find this post. If you find it let me know! I love C Ramchandra :) Would love to hear the songs from it, anyway.